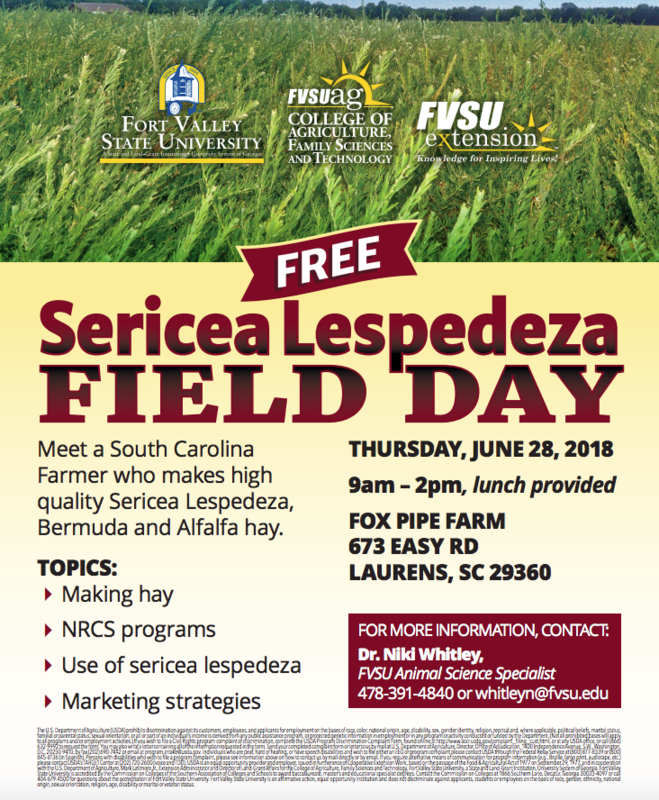 There will be a free Sericea Lespedeza Field Day held in Laurens, South Carolina on Thursday, June 28, 2018, from 9:00 a.m. to 2:00 p.m. Topics include making hay, NRCS programs, use of sericea lespedeza and marketing strategies. Meet a South Carolina farmer who makes high-quality Sericea Lespedeza, Bermuda and Alfalfa hay. This event may be of special interest to small ruminant producers since Lespedeza has tannins that can assist with parasite control. Watauga Extension will be driving a van to the workshop, leaving the from the local extension office at 6:00 a.m. A limited number of spots will be available for those wanting to ride along. Please contact our office at 828-264-3061 by Monday, June 25 to reserve a seat in the van. For more information, see the attached flyer or call Eddy Labus at 828-264-3061.